Category Archives: really really GOOD literature! Well written atmospheric novels make you feel as if you are right there, sitting with the characters. Freezing in the pelting ice or sweltering in the oppressive heat. 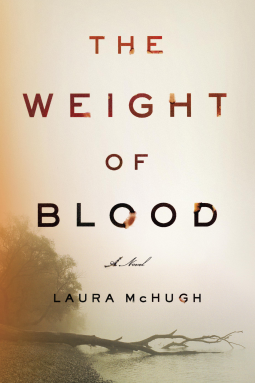 Such is the case with Laura McHugh’s The Weight of Blood, which places you in Henbane, Missouri, smack in the Ozarks. You will swat mosquitos, wipe the sweat off your brow, and feel as suffocated as the characters. Told from the perspectives of different characters, we primarily are in the heads of Lucy and Lila Dane, a daughter and her mother. Lucy is a teenager, living with her frequently absent father Carl. It’s the summer before her senior year of high school, and she gets a job working for Uncle Crete, Carl’s brother, at his general store. She becomes reacquainted with Daniel, a boy with whom she shared a Spin the Bottle kiss that she remembers vividly. She also faces the one-year anniversary of the death of her friend Cherie, a girl who battled mental and emotional disabilities. What happened to Cherie? Who killed her? Lucy wants to know. She also would like to know what really happened to her mother Lila. Coming to town at age nineteen, Lila immediately intrigued all of Henbane. With her exotic looks (shared by Lucy), most in the town figured her for a witch. She went to work for Crete but fell in love with his brother. Crete, ever the possessive sort, may not have liked that little development. But unquestionably, he is a devoted uncle to his niece, just as Lila was a devoted mother. So devoted that many cannot understand how or why Lila disappeared. Lucy’s curiosity about Cherie’s death and Lila’s vanishing act ignite the plot, which sends her off investigating the two tragedies. We learn some of Lila’s history form her point-of-view, and we get to know many of the two women’s friends and acquaintances. We quickly ascertain who is behind Lila’s disappearance, although it takes a little longer to understand what happened to Cherie. McHugh keeps us turning the pages by drawing interesting, developed characters. Lucy is unforgettable, and we come to want to protect her from what we know will be a devastating answer to the mystery surrounding her mother. We also hope that our instincts regarding the danger Lila finds herself in are wrong, if for no other reason than we would like for Lila to be the mother she yearns to be. The two share much in common, yet Lucy clearly has her father’s blood in her. Carl’s sweet optimism, all but diminished after his wife’s disappearance, is there in Lucy. The supporting cast, while appropriately quirky for Ozark denizens, are entertaining and believable. I enjoyed this book tremendously. It is well written and thought provoking. If the mysteries are a bit too easily solved, perhaps they were never the point anyway. Perhaps the central focus is a young girl’s search for herself, something she can’t do until she knows what happened to her mother and friend. Perhaps the greater issue is what comprises a family: does the weight of blood out-rank everything, or is what’s more important the people who are truly on your side? Filed under fiction, mystery, really really GOOD literature! Do not begin reading this book unless you have time to finish it, because you will not want to put it down. At all. The Thorne family has spent the previous year reeling – sadly not really healing – from the death of oldest daughter Anna, who fell from the roof of the school. Some say she committed suicide, others say it was an accident. Jon Thorne believes his daughter suffered an accident, and younger daughter Lizzie agrees. 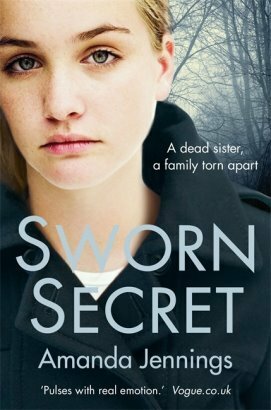 Kate is convinced something happened to her daughter and is determined to blame everyone, even though she might agree – deep down – that it was a terrible accident. Anna was the light in the Thorne home, beloved by parents and sister. But Anna, as we come to discover, concealed many secrets about herself, none of them savory, none of them what the family thought they knew about her. As Kate and Jon attempt to maintain their marriage in the face of their grief, Lizzie finds herself drawn to Haydn, the boy Anna was dating when she died. Her parents may be stuck in neutral, but Lizzie wants to live again. This is an excruciatingly painful book to read because the Thornes’ grief is so crushing. On top of that, Jon must deal with an Alzheimer’s riddled father, a distant and disapproving mother, and a rogue brother. But far more pressing is his family, specifically his wife. Oh, you will hate Kate. In fact, I found myself saying out loud, “I hate you,” more than once while reading. She is all but loathsome. Yes, we understand her grief. Absolutely. But she wears it like a badge of honor, as if determined to out-sad everyone around her. Jon points this out to her at one point, and she dismisses it, much like she dismisses him and Lizzie. Her youngest daughter’s need to connect with someone who understands her drives her to a romance no one approves of, and one that quickly becomes very serious. But Lizzie needs comfort. She needs someone to be strong for her, and if it’s Haydn, then she makes no apologies. The events leading to Anna’s death will not surprise you. From about the third page of the book, I knew what one of Anna’s secrets was, and I suspected others. But this isn’t a mystery. I know the blurb calls it a “domestic thriller,” but the “mystery” here is whether or not this family will survive together. Anna’s secrets are transparent to us from the start, although what actually happened when she died is shrouded in questions. Like I said, though, the Thorne family’s ability to work their way through their grief is the heart of this novel. Can Kate get out of her own way and see that her husband and daughter need her? Can Jon be strong enough for all of them? Can he stabilize his marriage? Can he help Lizzie? I loved this book on so many levels, including how complicated Kate was. Jennings treats her characters with respect, and if Anna’s secret life was too hidden, then we can forgive the lapse. (You would think that Lizzie would know more than she does, but no.) Kate, Jon, and Lizzie are wonderfully drawn, and their stories feel real and unforced. In fact, my biggest complaint is the cover. What in the world? It’s horrid. Witness Impulse, please correct that. Read this one. Seriously. Read it. Before we begin, let me say that I loved this book. I hated – HATED – the ending, but in the best way possible. Hadley is a college sophomore and leading a fairly staid, predictable, if not slightly dull life. She lives at home, where she helps her parents take care of her young brother. It isn’t that life isn’t good; Hadley’s life is almost idyllic to a certain extent. Her parents are happily married, her brother precocious, and she’s one of those people destined to lead a happy life. When the opportunity to study in Lausanne, Switzerland, arises, Hadley applies at the last second. She fears leaving her family in the lurch because she knows they rely on her. But her mother urges her to apply, and before Hadley has time to regret or second-guess anything, she’s heading to Lausanne, where she plans to study literature. She has a particular affinity for American literature, and an even more particular affinity for Ernest Hemingway, whose first – and perhaps most beloved – wife was named Hadley. On her first night, she comes across a gorgeous, older American man whose casual “Take it easy” makes her heart whirl. We know – even if Hadley may not – that she will see this man again, so when it turns out that he is her professor in a Hemingway class, we aren’t terribly surprised. But how does Joel feel about Hadley? She senses that he’s interested, yet he always seems to be a few paces out of reach. Fortunately, Kristina, a beautiful Danish girl, shows up and moves in next to Hadley in the dorm. Hadley is as taken with Kristina as she is with Joel. Kristina is exotic and worldly, and she has a confidence that Hadley envies as much as she does Kristina’s bra size. Kristina confides in Hadley that she’s having an affair with a married man, and while a little shocked, Hadley feels more curiosity than anything. 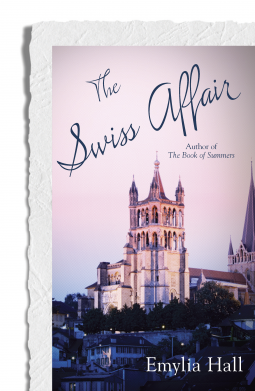 Another new friend is Hugo, an elderly Swiss man who quickly becomes an important confidante. Hadley’s life in Lausanne is coming together, and, even more significantly, Hadley herself is coming together. She is discovering who she is, and Lausanne is as important a factor in this self-realization as Hadley’s new friends. Hadley has to rely on two of her friends to help her understand what happened, why it happened, and who might be at fault. She is intellectually prepared for this, but not emotionally. The neat outline she crafted for her life begins to veer off course as she opens herself up to feelings she had not previously experienced. Her calm, orderly life did not have a Kristina in it, or a Joel or a Hugo. But it does in Lausanne, and Hadley has to adjust to what this new world means for her. The mystery at the heart of the novel sends Hadley on a mission for truth, and as she uncovers those truths, she slowly reveals to herself – and to others – the person she is becoming. 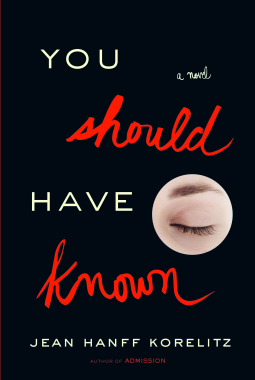 You will adore Hadley, for all of her faults and occasional too-good-to-be-true-ness. She is a young woman eager to learn, not just about Hemingway but about her friends, Lausanne, and herself. She knows she has been presented with an opportunity, and she will not squander it. Joel is an enigma for much of the novel, although, like Hadley, you will realize perhaps too late that you understood him all along. I liked him so much. Hugo is adorable, if not somewhat frustrating. He understands how the story will end for Hadley, and we are grateful that he is there to help her navigate her way through the events that befall her. Like Joel, Kristina is also a bit mysterious. She is everything Hadley is not, and the one complaint I have about this book is why Hadley is so entranced with Kristina. Is it that she’s just different from everyone else? She performs a favor for Hadley early on in their friendship, but surely that minor moment is not what binds Hadley to her? She seems selfish; she withholds as a means of control, and I wish Hadley could have seen that in her. Hadley’s response to Kristina seems extreme, yet it is that response that shapes Hadley more than anything else. Now, about the ending. It is gut wrenching, and I kept hoping that I wasn’t reading what I was reading. I wanted a different ending, even though the ending I wished Emylia Hall wrote is not an ending that in any way was possible. This novel ends the way it has to end – there is no other option – but oh how I wanted something else. I loved this book. Loved it. And you will, too. The In-Between Hour is about a man and a woman trying to overcome tragedies – and potential tragedies – involving their sons. And yet Barbara Claypole White manages to give us hope. Will Shepard (I won’t do a riff on the symbolism of his last name, but suffice it to say, I COULD) was a man with a plan: dump his pastoral North Carolina hometown and all of its inherent demons, head to New York, write books and never – or at least, very rarely – look back. No marriage, no children. Just “companions” and literary success. If his professional acclaim comes with the cost of writing a best selling detective series, Will can accept that. His aspirations don’t include Nobels or Pulitzers; it just includes doing what he enjoys and staying away from North Carolina. But the thing with all those plans he makes is that he forgets that he’s not the only one calling the shots. It turns out that one of his lady friends got pregnant, and the day she shows up with Will’s son is a day he never thought he’d see and certainly never thought he would enjoy. It turns out that Will takes to his boy Freddy quickly and passionately. He engulfs the child’s smell, he rearranges his life to accommodate him, and he forges an amicable relationship with Freddy’s mother. Will doesn’t necessarily approve of her life’s choices; she is a socialite with no understanding of responsibility, and she drinks too much. Her drinking, in fact, leads to crushing agony for Will: she drives drunkenly with Freddy in the car and kills him. As if this isn’t bad enough, Will’s widowed father has been kicked out of his nursing home for, basically, being an octogenarian thug. Jacob struggles with dementia, recalling his wife far more lovingly than Will does. He also struggles with remembering what, exactly, happened to Freddy. To ease his father’s mental anguish, Will decides to tell him that Freddy is traveling the world with his mother. When the nursing home calls, though, Will is forced to return home. Forced to deal with his father, and forced to figure out his next step. He winds up staying with Jacob in a guest cottage on the grounds of a home owned by holistic veterinarian Hannah, who has her own parenting struggles with her older son Galen. It would be trite to say that Will and Hannah heal each other, and it would also be false. We don’t – we can’t – heal each other’s spiritual and emotional wounds. What we can do is help them get through it, to survive, to – in Will’s case – live with it. This is a beautifully written book that will pull you in from the first page. If there are perhaps a few convenient coincidences (one of which almost feels cheap), they are offset by the moments that ring so real that they are almost difficult to read. Will is obsessed with finding out what happened to his son – what exactly did he experience in those final moments of the crash? When he envisions the suffering and wonders if Freddy called out for him, it is heartbreaking. I’ll admit it: I cried several times while reading The In-Between Hour. Hannah’s story is just aspoignant as Will’s, and and her uncertainty and insecurity regarding Galen is understated yet evocative. We understand from the start how frustrated she feels and how stymied she is by Galen’s illness. Will and Hannah are interesting people whose struggles make us care for them. In some ways, Hannah is almost too good to be true, which makes her screw ups so appreciated by us readers. They make her more approachable. The setting is as big a character as any of the humans in this tale. Mountains, Indian reservations, forests – nature beckons Will. Everything that he has resisted for so long winds up rescuing him. It’s a lovely book that touchingly, gently, respectfully discusses some terribly sad subjects. For more information regarding Barbara Claypole White, visit her website, Facebook page, and Twitter account. To read other reviews, check out the tour involved for this novel (the schedule can be found here).